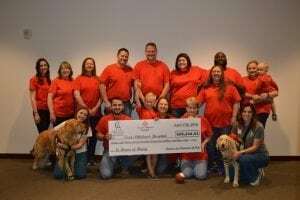 Cypress Ace Hardware Check Presentation – Ace Hardware Corp.
Cypress Ace Hardware owners, Bill & Susan Murff, along with several of their team members visited Texas Children’s to present a check for $98,244 amounting to their 2017 fundraising. Cypress Ace was the second highest fundraising store in the nation. In addition, Bill Murff was recognized as the 2017 Ace All-Star Retailer. Overall Houston’s Ace Hardware stores raised over $359,000 last year for Texas Children’s Hospital through the Children’s Miracle Network Hospitals program. Thank you Ace Hardware! Cypress Ace Hardware employees visit Texas Children’s to present a check for their 2017 fundraising efforts.